March’s healing justice workshop will include a dialogue facilitated by local activists and farmers on food justice. Food insecurity is a problem that plagues our community. Led by long-time FCCAN activists and food growers, this talk is meant to get us thinking about how we can reconnect to food as a community. Eating food is an ultimate act of communion with our Mother Earth. Growing one’s own food can be a sacred act that strengthens that connection. Growing your produce own also reduces your carbon and water footprints by not supporting food production systems that are both many miles away and (often) utilize non-sustainable practices. Drew and BT will share techniques (and a bit of their philosophy) about gardening in this area. Together they have decades of experience as Front Range gardeners. Using a planting calendar as a starting point, they will share ideas about starting your own plants, planning and planting your garden, container gardening, irrigation, composting. 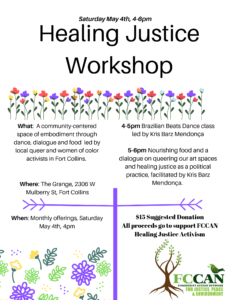 This will be an interactive dialogue, where you will get a chance to break out into groups and meet other interested folks in the community who want to work at the intersection of social justice, healing justice and gardening! A good portion of the session will also be dedicated to question and answer, letting the participants direct the course of the conversations. Participants will be offered a tour of their gorgeous and expansive gardening operation at the Historic Cherry Mill Farm and will be invited to partake of some delicious food made mainly with their farm-raised produce, eggs, and meat. Throughout the month of April and May all participants will have the opportunity to apply what they learn with smaller hands-on food and gardening workshops at the farm, sign-up sheets and information will be at our March workshop! The event is hosted at BT and Drew’s farm on 200 Gregory Road, Fort Collins. Please arrive at least 10 minutes before 4pm for parking, and to participate in the meditation and yoga practice beforehand. If you plan to participate in the yoga session, please bring your own mat! A $15 suggested donation goes directly to support this work! PS-There is also a labyrinth on the farm (no joke), so arrive early to explore if you’re interested.